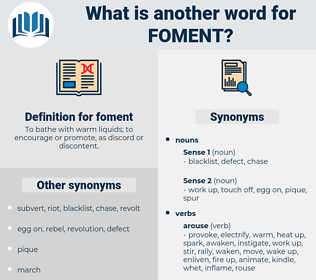 What is another word for foment? To bathe with warm liquids; to encourage or promote, as discord or discontent. 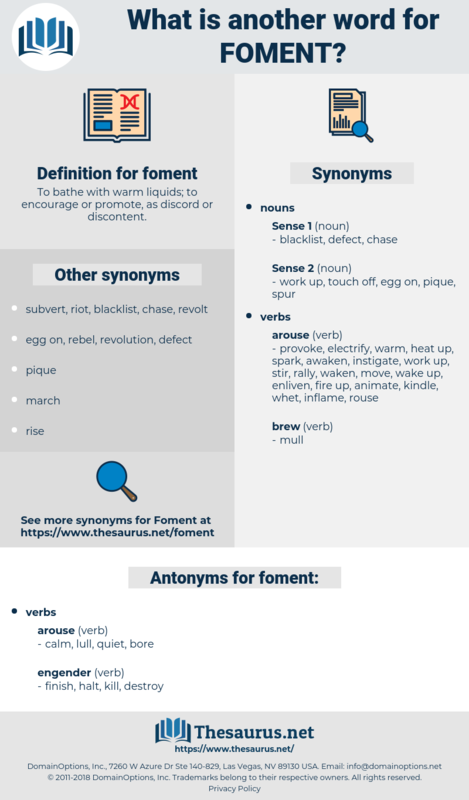 instigate, inflame, provoke, incitement, ignite, stimulate, exacerbate, arouse, heighten, nurture, fuel, generate, stir, stoke, spark, bolster, raise, trigger, fan, create, enhance, excite, inspire, instill, boost, cultivate. moderate, deaden, tranquilize, pacify, compose, repress. stop, dissuade, cease, dampen, discourage. cool, put out, soothe, quench, appease, placate, alleviate. hold, regulate, allay, rein, bridle, curb, constrain, still, check, settle, tame, restrain, inhibit, subdue.